Luxury silver French furniture at its best. The sumptuous decadence of burlesque has been present in interiors for a while. The Estelle Collection brings a subtle glamour to the bedroom. The Estelle Collection is constructed of pine and MDF with silver leaf detailing to create a unique and glamorous look. 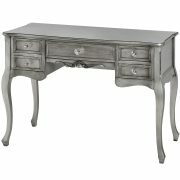 View Basket “Estelle Collection Silver leaf Five Drawer Dressing Table” has been added to your basket.